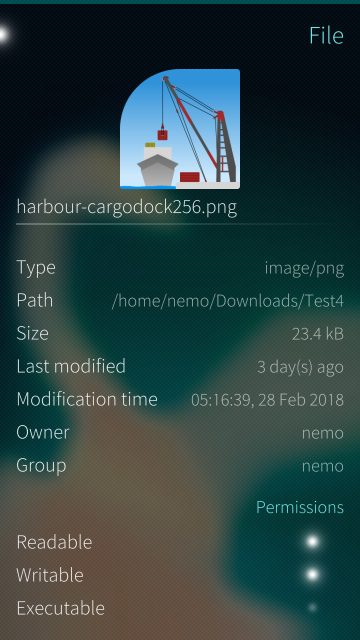 A two-paned filemanager for Sailfish devices. Please report bugs and write your suggestions at project or my fork page. [FIX] Due of messed xml syntax in zh_cn translation no translation files were included to package. [NEW] Added options to change sorting order for local filesystems. Can be found at Settings page. [FIX] Fixed infinite back navigation from Places in modern ui. [FIX] Fixed using of unreachable models in classic ui. [MISC] Changed wrap mode for internal text editor. [NEW] Added basic "Tools" to manipulate files with external commands. [NEW] Simple editor for text/plain mime type and for *.desktop files. 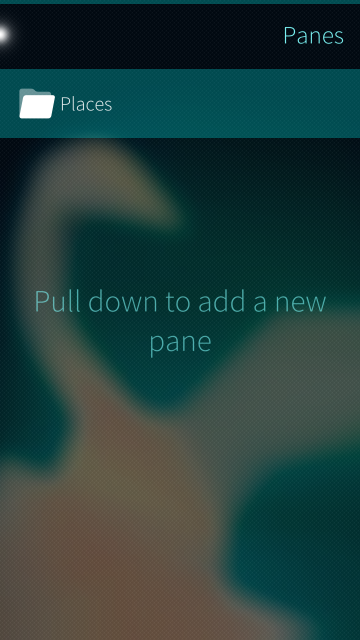 Press and hold preview text to enter edit mode. [FIX] Some more strings are translatable. [NEW] Added new-ui branch interface as an option. It's possible to make places page customizable. Thanks for the app..works like a charm. Ps: webdav and owncloud icons in setting dont scale properly. 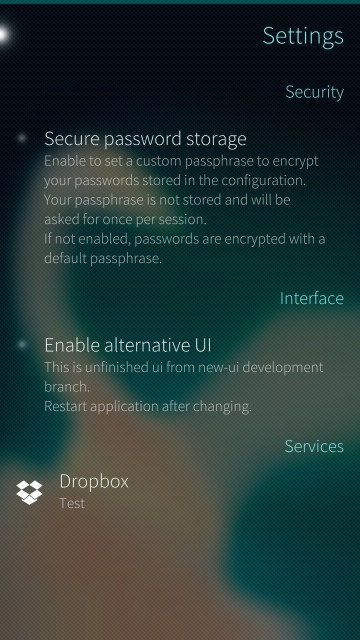 And also a feature request: it is possible to add menu to share from owncloud? What do you mean by sharing? 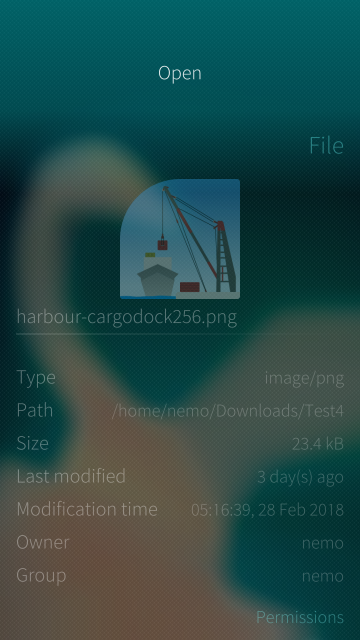 Thanks for your great work and please keep on developing for Sailfish. Do I have the possibility to donate? Thanks for your feedback. Best donations - reported bugs and valuable pull requests. Would be nice if you can add some editor that you can edit the .desktop files like we have that into FileCase? Someday... There're a lot of editors. 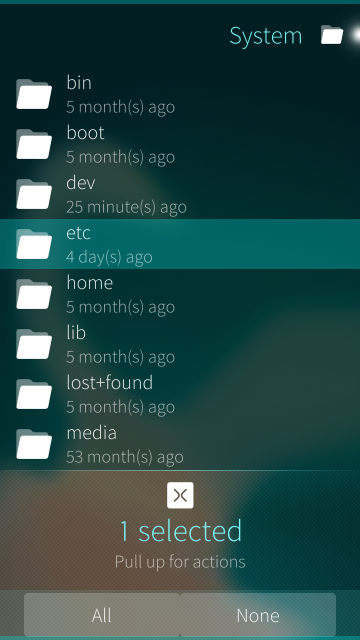 I can add an option to open files with default app or with custom from editable list. That would be nice, i ask this becoss i need to edit the desktop file of a android app when it would updated, otherway it dont start i need to change something into the .desktop file that's the resion. You can test it now. File size limit is 16 kbytes. Thanks for the editor works perfect ! PS: Create option to cut files and paste too. If you want copypaste - use alternative ui. Please create option in UI to copy files to others folders in memory disk or SD card. Create too copy paste to folders Dropbox to memory disk or SD card. Very thank. You can copy files from DropBox everywhere. 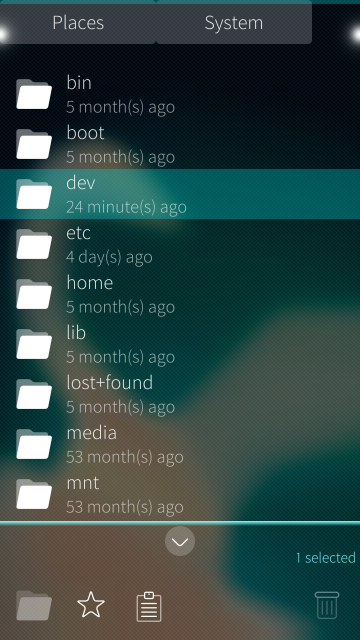 In Classic UI (default) open source and destination folders in both panes, long press and select needed files, at bottom menu select "Copy to other side". Modern Ui works in other way. Navigate to source folder, activate toolbox, select files, press clipboard icon in toolbox. Deactivate tool box, navigate to or open in other pane destination folder, activate toolbox, press clipboard icon.